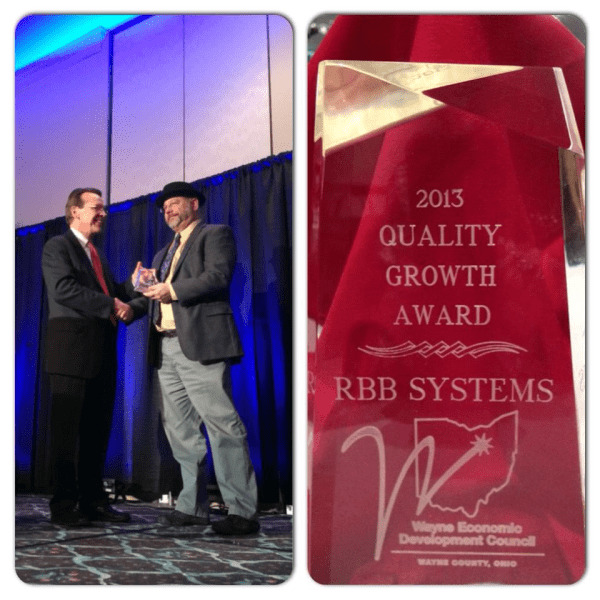 On Thursday, January 16th, 2014, in front of a crowd of 800 local business and community leaders, RBB was greatly honored to receive the 2013 Quality Growth Award from the Wayne Economic Development Council (WEDC) at the Annual Dinner of the Wooster Area Chamber of Commerce. RBB has done business in the Wayne-Holmes community since 1973 and for most of our history we worked from a full service provider business model. But in 2008 the company pivoted. Instead of satisfying a dozen or so ongoing customers with their entire electronic and electrical product needs, RBB decided to optimize its business to provide recurring small batches (1 – 200 pieces is typical) in a fast, efficient, and profitable way. We’ve invested heavily in people, equipment and expertise to realize the potential of this underserved market niche. To learn more about this honor, check out the special award video put together by the Chamber for the event or stop by our Facebook page to see pictures from the exciting night!